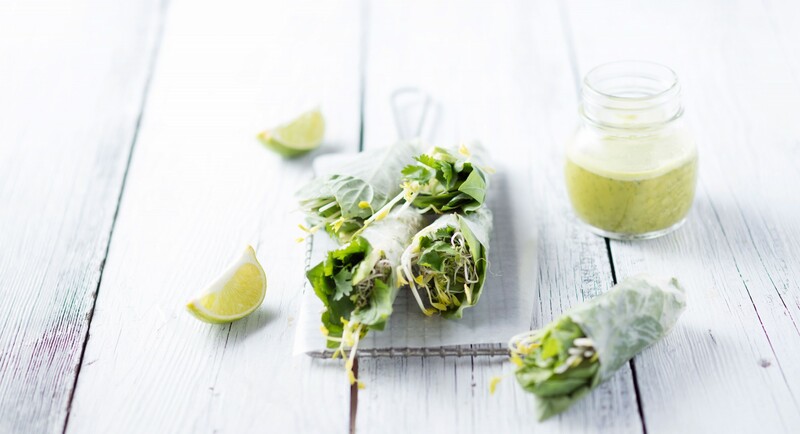 St. Patrick's Day calls for a celebration of all things green—including refreshing veggie spring rolls! Full of bright herbs, crisp pea shoots, and creamy avocado, they make a wonderful light lunch or healthy appetizer. Process cilantro, ginger, garlic, chili flakes, lime juice, sesame oil, and salt in small food processor until finely chopped. Refrigerate until ready to serve. Dip 1 sheet of rice paper in a bowl of cold water for 5 to 10 seconds to soften slightly. Place on a clean surface and top with spinach, avocado, peas and sprouts, cilantro, and mint and basil leaves. Fold short end over the filling and roll to enclose. Repeat with the remaining ingredients.